When your head is on straight…everything changes!!! …is Multiple Sclerosis related to trauma to the head and neck? On this blog in the past we have looked at the correlation between blood flow studies and head and neck trauma (http://wp.me/pscJU-5Q). We have looked at the research out of Europe demonstrating how an invasive surgery to the veins that drain from the brain is showing remarkable improvement in MS patients (http://wp.me/pscJU-5L). And now another study linking MS to the neck. Approximately 400,000 Americans have MS and every hour someone is newly diagnosed. Worldwide, MS affects approximately 2.1 million people. No two people experience the symptoms of MS the same way nor do any two individuals show the same progression of the disease. The Central Nervous System dysfunction associated with MS results in a wide variety of neurological symptoms ranging from tingling, numbness, and slurred speech to visual disturbances, changes in brain function, and paralysis in severe cases. Some chiropractors specialize in techniques focused solely on the upper cervical area of the spine (upper neck). These techniques have been shown to have a global effect on physiology with positive outcomes in patients with upper neck misalignments. It should be noted that the objective however is not to treat the presenting symptom as much as it is to reduce the upper cervical misalignment itself for the inherent benefit of improving the function of the nervous system. The positive outcomes from this type of correction have been observed in all age groups from pediatric to geriatric. Upper cervical chiropractic care has been shown to be safe in spite of complicated case presentations including those with previous spinal injury due to trauma, infection, or other abnormality. There is growing evidence linking previous trauma to the onset and diagnosis of Multiple Sclerosis, implying a connection between stability of the cervical spine and the onset of the disease. Dr. Elster has also reported on some promising work on the effects of upper cervical specific chiropractic care and the positive outcomes of MS patients further linking the progression of the disease with the position and stability of the upper cervical spine (http://www.erinelster.com/PDFabstract.aspx?PDFID=10). With all of the evidence pointing in this direction…doesn’t it make sense to at least evaluate that area of the body to see if you could be helped with Upper Cervical Specific Chiropractic Care, such as NUCCA? You have nothing to lose and much to gain from an evaluation! To get a thorough Upper Cervical Spine Examination contact our office www.nuccawellness.com or if you are not in the Southern California area go to www.nucca.org or www.upcpine.com. Cerebral Palsy (CP) is the most prevalent lifelong developmental disability in the United States. Recently I have seen a tremendous change in a patient with Cerebral Palsy and began investigating the impact that upper neck misalignments have on people diagnosed with CP. Dr. William Amalu of the International Upper Cervical Chiropractic Association has published an amazing case study of a 5-year-old boy confined to a wheelchair with Cerebral Palsy, blindness, chronic ear infections, and severe seizures (30 per day). After a thorough evaluation the patient was determined to have an upper neck misalignment and Dr. Amalu began a course of care. After the first adjustment, the patient’s mother noted that he had his first good night sleep in weeks. After the second adjustment, the patient’s seizures reduced dramatically to only 10 per day, his vocal drone became a quiet intermittent moan, and he began to clap his hands. His mother noted that he had become more alert, continued to sleep more soundly, began sitting up and looking around, responded to sounds by looking toward the source, and continued with a decrease in seizures to only 5 per day. During the third and fourth week of care the seizures continued to occur at 5 per day, but all grand mals had ceased. He was sleeping completely through the nights now. For the first time in his life he said “dada”. By the end of the fourth week, his therapists suspected that his vision was suddenly improving. A re-examination of the patient was also performed at this time. There were no signs of any: vocal drone, writhing motions, upper neck muscle spasms or tenderness, restricted neck ranges of motion, or ear fluid. He was now capable of sitting up on his own and his mother reported that for the first time he pulled himself up and stood for over one minute. He began showing fine motor skills this week by grabbing his own pacifier and placing it in his mouth. The patient now showed avoidance to bright light, visual fixation and following, and normal direct and pupil reflexes. His mother noted that this was his first month free from ear infections in 9 months. By the end of the fifth week of care the patient was seen by his neurologist and ophthalmologist. His ophthalmologist noted a drastic improvement with a recovery of central field vision. The patient’s neurologist reported that his CP had greatly improved and that he would be requesting further tests to evaluate his seizure condition. The patient’s follow-up examination with his pediatrician noted that his ears were normal and that tubes would not be necessary. During the time period between the seventh and twelfth week, the patient’s seizures steadily reduced to the point of staring episodes only. There were no outward signs of seizures by the end of the twelfth week. Over the next 10 months, the patient continued to improve. His neurologist slowly reduced his medication causing his staring episodes to go away. With further testing, the patient was eventually classified as non-epileptic and final withdrawal of all medication was made. He never experienced another episode of the ear infections. His vision improved to the point where he was prescribed glasses. The patient continued to learn simple words with clear pronunciation of “dada, mama, eat, and food”. His fine motor coordination improved such that he was learning to feed himself. The patient’s mother noted that he was also potty training. His gross motor coordination continually progressed to the point that he was able to walk slowly with the assistance of holding one hand. Another study was published where seven patients were tested – two children and five adults. All patients in this study had improvements in many areas including decreased muscle spasms, improved sleep patterns, decreased irritability, decreased pain, and decreased incidence of respiratory and other infections. One child had four unsuccessful surgeries to correct strabismus (crossed eyes) after two adjustments, the crossed eyes were gone. The children were able to hold their heads up for longer periods and are making more attempts at crawling or standing with support. There is also improved clarity and volume of speech in patients with speech and hearing problems. With care, there is overall decrease in muscle activity at all levels and balance improved with eyes closed. It is clear to see from this research that the connection between neurological conditions like Cerebral Palsy and the upper neck area should be investigated. The brain stem dysfunction that is present with an upper neck misalignment is significant and a variety of different conditions can be caused or exacerbated by this type of a problem. All Cerebral Palsy victims should be evaluated for upper neck misalignments and brain stem dysfunction as soon as possible. Amalu, W. Today’s Chiropractic May / June 1998. Cortical Blindness, Cerebral Palsy, Epilepsy, and Recurring Otitis Media: A Case Study in Chiropractic Management. Previously on this blog I have talked about the connection between problems in the upper neck and Multiple Sclerosis and Parkinson’s. In the March Edition of the Journal of Upper Cervical Chiropractic Research Dr. Justin Brown and Dr. Jonathan Chung describe the great results that a patient from their clinic had with symptoms of Parkinson’s Disease following the correction of a specific misalignment of the bones in the upper neck, known as the Atlas Subluxation Complex Syndrome utilizing the NUCCA Procedure www.nuccawellness.com. It was a 67 year-old female patient who was presenting with complaints of weakness, tremors, scoliosis and rigidity due to Parkinson’s disease (PD). She reported the symptoms began 5 years prior to starting care and was diagnosed with Parkinson’s disease shortly after the symptoms began. She also stated that she fell almost every day due to the issues with the balance. The severity of her symptoms had contributed to her missing work and reducing her ability to perform her normal activities. Jubault et al found evidence that brain stem atrophy may be the first identifiable stage of neurodegeneration in patients with Parkinson’s. The authors also note that the neural degeneration at the brainstem level may be responsible for many of the symptoms experienced by patients with PD. Dysfunction at the brain stem level is also implicated in other studies of advanced PD. 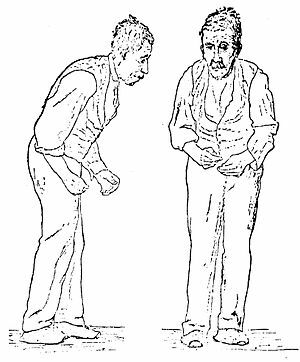 It is hypothesized that the upper neck misalignment can aggravate and mimic Parkinson’s symptoms by progressively altering the blood and nerve flow to the brain stem. The correction of the atlas subluxation complex can only be accomplished through specific upper neck adjustments by specially trained upper cervical chiropractors. General chiropractic manipulation cannot correct this problem. If you or someone you love has been diagnosed with Parkinson’s Disease then an upper neck evaluation should be performed to see if an undetected brain stem injury could be the root cause. If in San Diego County go to www.nuccawellness.com in other areas of the world go to www.nucca.org or www.upcspine.com to find an upper cervical specialist in your area today!